Today, the Paulick Report offers a second print edition available here and on the grounds at Keeneland, where the January Horses of All Ages Sale continues. In this edition of the PR Special, Natalie Voss resumes her look at medication in racing from the British perspective. 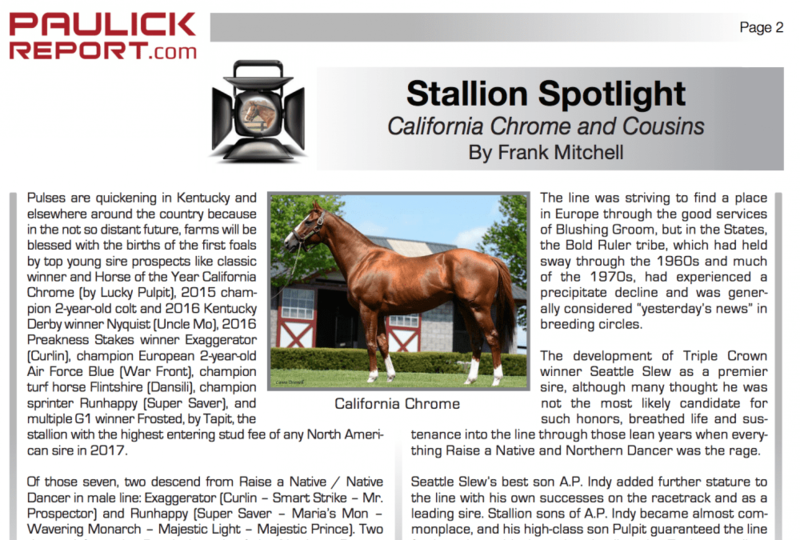 Frank Mitchell turns the Stallion Spotlight on the young sires whose first foals will be born this winter and spring. They include California Chrome, Nyquist, Exaggerator and Frosted. Plus. another handful of hip numbers to keep an eye on at the sale in Five to Watch. In the Honor Roll, learn the story of January sales grad and Pegasus World Cup contender Giant Expectations, and in Ask Your Veterinarian we learn about rotational deworming products. Click here to read this Keeneland January edition of the PR Special. This entry was posted in PR Special, Ray's Paddock and tagged California Chrome, Frank Mitchell, Frosted, giant expectations, horse racing medication, Keeneland January, nyquist, PR special, Thoroughbred Auctions, thoroughbred sales by Paulick Report Staff. Bookmark the permalink.